Here's a photo of a 1949 political billboard from Pittsburgh. The photo, courtesy of the Pittsburgh Courier Archives, is by Charles "Teeny" Harris, who took over 80,000 pictures depicting black life in Pittsburgh. 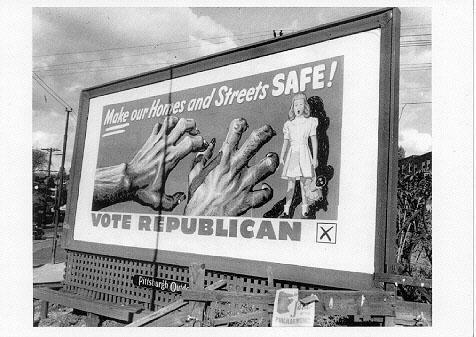 The billboard is by the Republican party, which I guess hasn't changed much in fifty years. I originally saw this on Orcinus, who credits d. eaton with pointing it out to him. I think this image serves as a cogent and simple reminder that the political appeals to fear -- by either party -- are not some sort of new technique. They're not a unique outlier of a type that has never been seen before. They are part of the grand and sordid tradition of American politics. In a very real way, the terrorists of September 11th are the best friends of those in power in the US; they've provided a new set of images for our leaders to use to try to keep us scared and docile. If those images weren't here, our leaders would use other images -- whether it's Democrats talking about my Social Security being taken away, or Republicans talking about how protecting the environment from being poisoned will somehow make me lose my job. The only question I really want to know the answer to is: how do they sleep at night? The Internet Veterans for Truth has a "fear itself" clip -- very relevant.